Giveaway: Win a Pair of Pretty Shoes! Every day without fail Mother Nature gifts us with endless beauty! And flowers are one of the most precocious presents that she blesses us with. It was even once said that “Flowers are the smiles of the earth”. How beautifully put and so true, too! Just as pretty as they are, they can equally be one of the most wonderful gestures to express our feelings. All over the world giving flowers has become the loveliest, non-verbal way to show affection. Whether you want to say sorry, I love you or just a simple thank you, it’s a gift that is always appreciated. The moment when they put a happy smile upon the receivers face always, always warms my heart without fail. Now it’s time to spread some joy to you guys, too. Instead of buying you flowers in the usual way I thought you’d all prefer a shoe bouquet! So, to celebrate my Birthday I teamed up with HÖGL Shoes, and we’d love to give you the chance to win a pair of fabulous floral heels. And I promise, these flowers will never fade! So why not join the giveaway on my Instagram (link to post here). Now that spring is finally in full force it’s time for us to start blooming beautifully with our outfits, too. And thankfully HÖGL’s new floral shoe collection is just like a stroll through an enchanted garden. 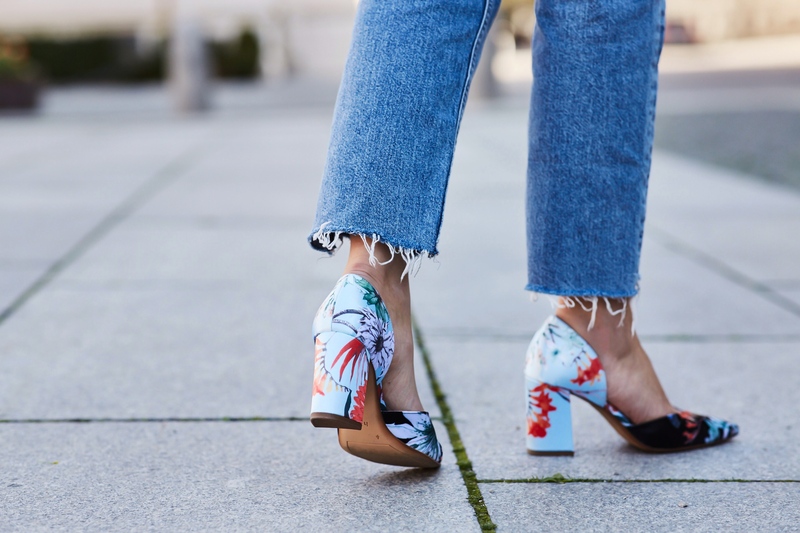 The pretty petals are printed onto sleek satin or high quality leather, shaping a variety of comfortable yet stylish designs: from elegant envelope heels, trending sling-backs and even fabulous platforms – there’s at least one pair of dream shoes for every type of fashionista. I chose my floral favorites here to highlight some of my spring styles. 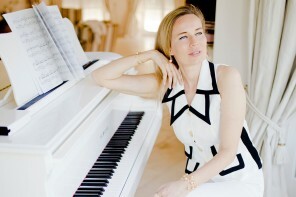 Finally, being able to wear light summer chiffons, that playfully swirl around your bare legs can be so liberating. This one I chose is definitely a fabulous and fun fabric to party around in. To add a little “je ne sais quoi” to my rather simple B’day outfit I decided to wear a flower crown on my head and beautiful blooms on my feet. “FAYE” by HÖGL to be precise! Aren’t the delicate little cherry blossoms on those pretty ankle straps pumps just the most adorable motif!? Coincidentally, I picked this wonderful shoe as a giveaway for you all. Besides both gracing and enhancing your looks – even just the everyday ones – you will also own a pair of heels that you can comfortably walk in. In grand style, of course! Floral prints are a mixture of both classic and equally mesmerizing motifs that will never go out of style, especially in springtime. Seeing them literally pop up in stores, always makes me feel like it’s a sign to get rid of all the winter layers that we just can’t wait to unleash. The same principle applies for pretty pastels too. They are a fantastic colour range that enable us to create fresh, clean looks. One might expect that a girly dress is the best way to style floral shoes, but a modern suit can look just as fab if not more so. For my olive-green platforms by HÖGL I chose a monochrome lavender ensemble that created a, well, let’s just say a more grown-up look. The lace-up bodysuit adds some feminine sensuality into the mix too. I love how the floral embellishment along the décolletage picks up the flower-theme of the shoe. These “SUGAR PLUM” sandal are a wonderful way to bring exotic vibes into the city. The platform soles are decorated with a gorgeous hibiscus motif. In addition, they help lengthen the legs – always a winner in my book! But fear not, for high-heel standards they are still comfortable enough to stylishly strut around in. A simple shirt and cropped high waist denims – one of my most favored everyday combos. Too simple you might say? 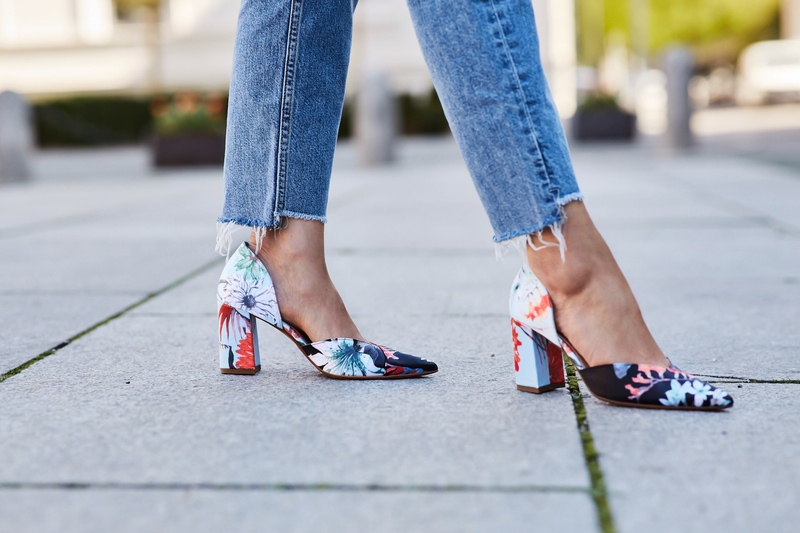 Okay, okay, then why not opt for a pair of show-stopping shoes adorned with multicolored petals to liven things up a little. This elegant envelope pump with pointed toe perfectly elevates any outfit. 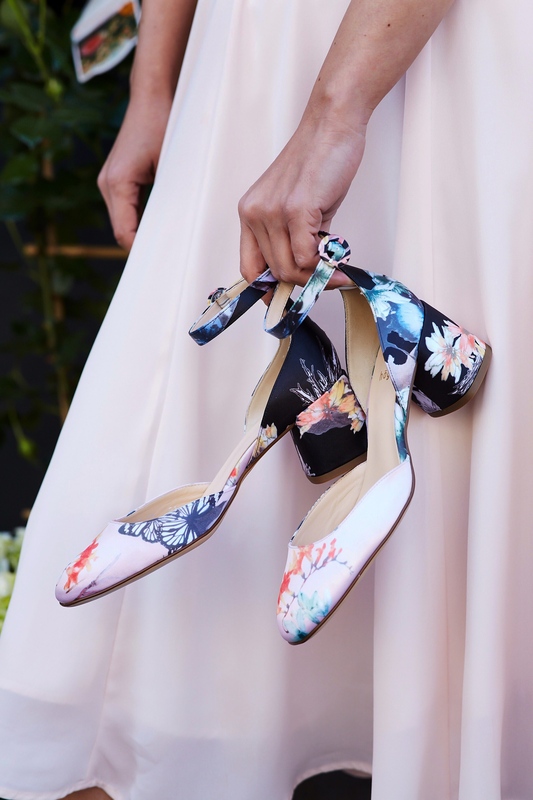 These “KEY CODE” heels illustrate a floral print that whimsically runs from the darker toecap to the delightful blues that feature on the heel, and finally finding its way up to my fashionista heart! Has it reached yours yet too? This year is great S/S for large beautiful florals . I love 💕 the choices you’ve made ! Darling I just posted on big bold florals in fashion this S/S2018.